I had okra for the first time in Amherst. My mom is growing it in her garden. I liked it. My sister Dana made fried okra, and it looks soooo good. Inspired, I sent Alex to buy okra, but only frozen was available. Oh well. I used half a bag of sliced okra, and let it thaw first. It should get slimy, if not let it soak in the buttermilk for a while. Mix the cornmeal, salt, pepper and paprika together in one bowl. In another bowl, mix buttermilk and chili sauce. 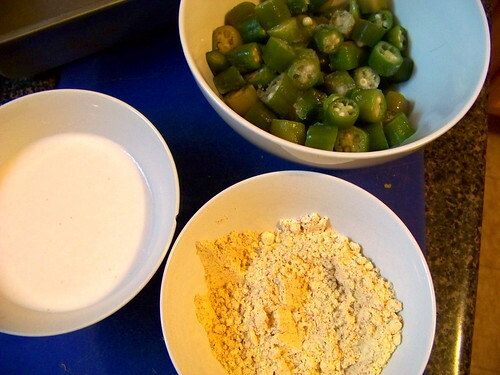 Working in batches, soak the okra slices in the milk, then shake gently to get rid of drips, and toss in cornmeal mixture. Repeat with all the okra. It's a good idea to have one hand be the dry hand for the cornmeal mix and one hand being the wet hand for the okra and the buttermilk. 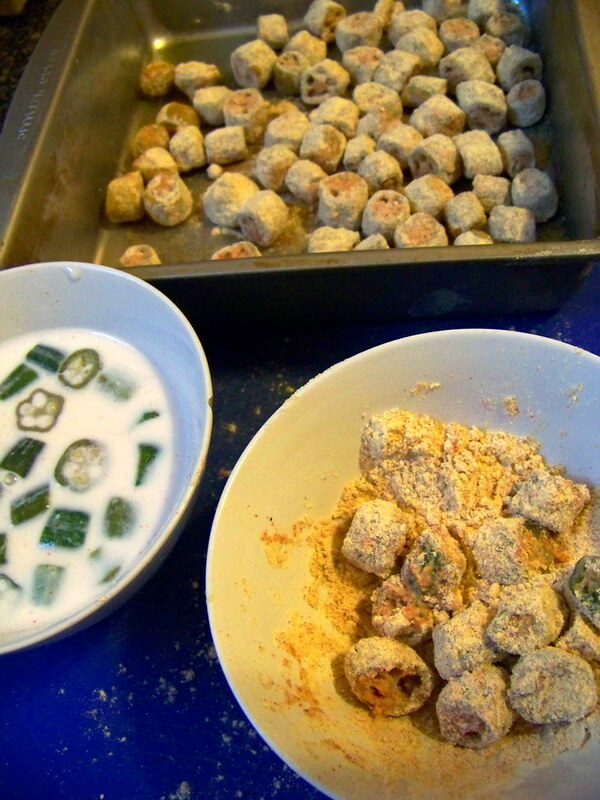 Heat about an inch of oil to shimmering, and fry okra in batches, you only need about 2 minutes each batch. Taste the first batch, they're good if you sprinkle a little salt on them after they come out of the oil. Eat hot. Cornmeal, great idea! I tried the pamela's mix a while back to try to coat my okra and it was awful, thanks!! Cornmeal is great for frying most things!!!!! And/or if you do eggs, you can roll the okra in some whipped egg instead of buttermilk. That's the way my mother in law taught me this summer. I like the idea of adding the paprika - I will have to try that next time. This looks so good, and maybe your recipe fooled me, but it seems really easy to make. I've never really wanted to experiment with okra before, but suddenly, I want to go buy some. Now I just wonder what you eat with it - or does a meal work on fried okra alone...? Renee- I usually dip things in eggs before I fry them, so I bet it's be just as good! 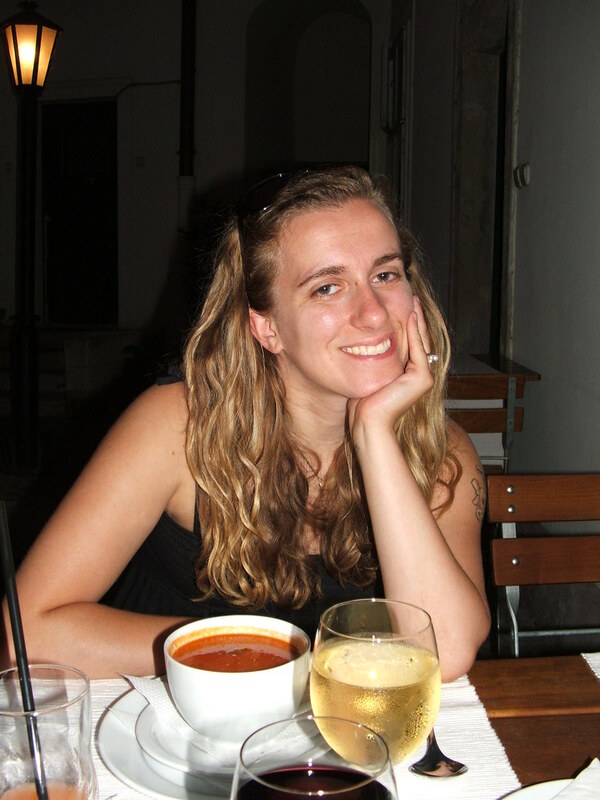 Dana - no, you weren't fooled, it is definitely easy! I hadn't really been interested either until I tasted it, and then my sister made some, and suddenly I had to too. I think they'd be best as a side dish, although you could probably make a meal of a big bowl of them.